July 12, 2018 Hi-End AudioBy DEANknows! Let’s face it; we’re all suckers for a good marketing campaign. The Beats by Dre headphones are a great example of a mediocre product finding stratospheric success through marketing. When Beats by Dre headphones hit the market, they mounted a massive campaign that starred none other than Dr. Dre himself. It didn’t take long for Beats Electronics, the company that produces the Beats by Dre headphones, to reach annual revenues of over $1.5 billion. In just a few short years, they have become so en vogue that the mighty Apple has agreed to purchase them for $3.2 billion—yes, billion dollars! Believe it or not, this purchase is Apple’s largest hardware acquisition to date. Considering these headphones cost upward of $379.99, and with this level of popularity, they MUST be pretty good headphones right? WRONG! These are, by almost every measure, a terrible set of headphones. Truthfully, in the word of high-end headphones, $379 is not a lot of money. The best headphones in the world can cost thousands of dollars and require specific headphone amplifiers to play. Beats Electronics must have done their homework to find the “sweet spot” where they sound expensive, leading the consumer to believe they are high quality, but not priced too high as not to sell. Bose has done a similar hat trick with their product line. Read our article about speakers better than Bose. But you didn’t click this article to hear about super-expensive headphones; you clicked it to know what set of “ear speakers” you can buy that will blow the earpads off Beats by Dre. These headphones are not in order of sound quality, which can be subjective, but based on our testing and experience, we are happy to say that any of these sets are far superior to what you get from those other headphones that are not much more than neck candy. I wanted to start off with an example of a tried-and-true product that is crazy inexpensive and really demonstrates how silly the Beats By Dre headphones are. 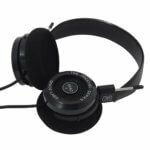 Grado has been in business since 1955, making only a few products . . . and yes, one product is headphones. 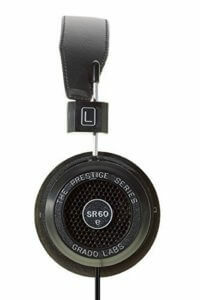 The Grado SR-60 went into production in 1994 and has remained a well-respected product to this day. These are not “over-the-ear” headphones, but give a balanced, clear, and accurate picture of how music is supposed to sound. Wait until you tell your 16-year-old that this $79 pair of headphones will make the Beats sound BROKEN. 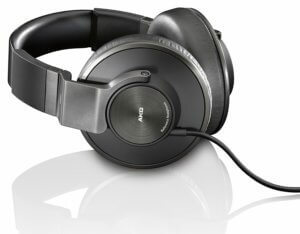 The AKG K550 Headphones are full “over-the-ear” or “closed” headphones. They have a tremendous build quality with a full balance, but most of all they have tremendous BASS. I thought they would be a good addition to this list because the marking of the Beats by Dre leads you to believe that you will have a thunderous bottom end—Dr. Dre jams to them, for Pete’s sake. Once you put these on your head you better watch out. . . you’ll feel like you’re back in the 90s, in a Low Rider with ten 15’s, and having the police called on you for rattling the pictures off your neighbors’ walls. 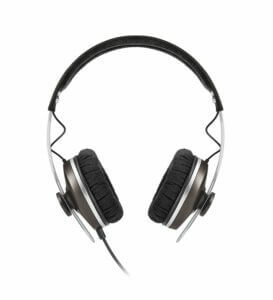 Another reviewer was quoted as saying: “The K550 delivers excellent sound quality, with a 50-mm driver, the largest AKG offers in its headphone line. Thanks to their closed-back design, true AKG sound can be enjoyed without disturbing others. As the company who “invented the stereo headphone” in 1958, it just wouldn’t be right to leave them out. Another great sounding set of headphones for under $100, these are built like a tank and should last forever. They have a very clear tone, but not the set of headphones for the “Bass Head”. Their one downfall is that they aren’t the most comfortable headphones in the world, and they may not lend themselves to long listening stretches. 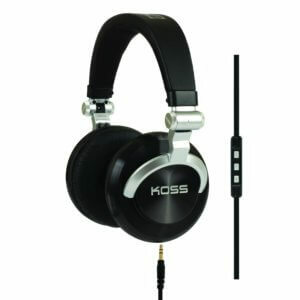 Koss ProDj200: Full-size noise-isolating Koss Headphones. Stylish, spun metal ear cups that swivel 180 degrees allow you to shift between single and double-ear listening. Transition from stereo to mono audio mode in a flick of a switch. Flexibility to change cords with a new detachable cord design. Includes professional grade 8-foot coiled cord and a 4-foot straight cord equipped with Koss Touch Control (KTC) remote and microphone technology made for iPhone at, iPad at, and iPod at, also compatible with other Smart phones. Another monster name in the world of headphones is Sennheiser. They have been making headphones for over 65 years and make some very high-end products. 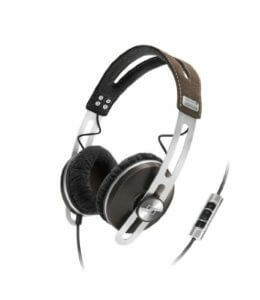 Sennheiser MOMENTUM headphones have been available for a handful of years and have steadily dropped in price. They initially went for over $250 and were a pretty good deal at the time, but are now substantially less expensive. These “over-the-ear” headphones are light and comfortable while giving exceptional balance and detailed sound. The MOMENTUM is available in a variety of finishes and colors, so you might be able to get your teenager to wear them in public. These headphones have a fancy little “wand” for volume adjustment and immediate muting if you have them plugged into your iPhone and you get a call. Bowers and Wilkins (B&W) have been making hi-end speakers for years and have an excellent reputation for build quality and sound. The B&W P5 headphones fit right in line with everything they are known for. These headphones don’t have the head rattling bass or the zinging top end of many other headphones, but they give an accurate picture of the music, especially for classical and a beautiful reproduction of the female voice. With a mid-range about as clear as one would expect from B&W, similar to the Koss headphones mentioned above, these also tested as being slightly uncomfortable for long listening stretches. P5 Wireless combines the fantastic sound of P5 Series 2, with advanced Bluetooth streaming for unrivaled wireless acoustic performance,3.5mm stereo mini jack (CTIA 4-pole). An incredible battery life of 17 hours of wireless playback between charges. P5 Wireless charges via USB; but if you also want to save your battery, it comes supplied with a cable. 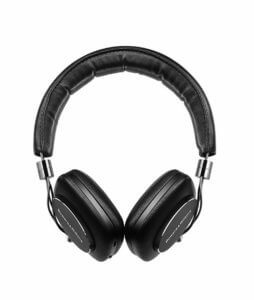 Using high-quality Bluetooth aptX, these headphones allow you to stream Hi-Fi quality music from your smartphone, tablet or computer. P5 Wireless features drive units based on the award-winning P7, designed with diaphragm-like traditional loudspeakers, resulting in more precise diaphragm movement and superb sound quality. 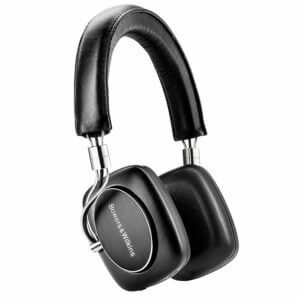 Bowers & Wilkins P5 Wireless Headphones come with a 2-year limited warranty only when purchased from an authorized dealer including Amazon.com (indicated by ships from and sold by Amazon.com). If you experience Bluetooth connection issues, please update your device to the most recent software and make sure you have a stable streaming connection (i.e., Wifi/Data). To sum up why the Beats by Dre headphones are so crappy, they seem to have focused entirely on digital marketing and not on what type of product they were producing. At the end of the day, I guess it worked: they sell like hotcakes. As the best example of the polar opposite of the Beats by Dre headphones, take a look at what is widely considered the best headphones in the world, the Stax Earspeaker. These electrostatic headphones cost upward of $5000 and need other hardware just to play. My guess is you’ve never heard of them, and that could be likely because they focused more on their product and less on marketing the product.